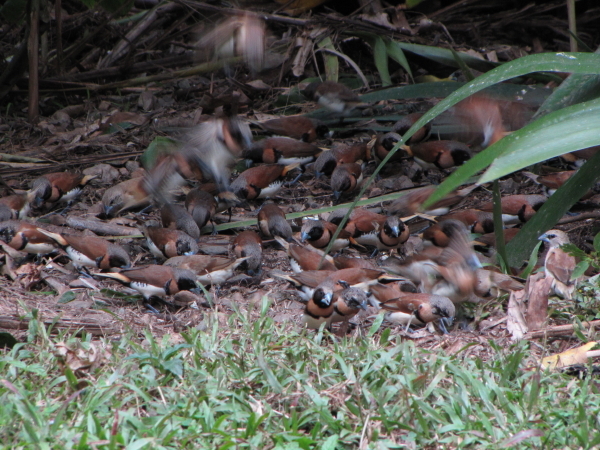 Red-browed finches (Neochmia temporalis) and chestnut-breasted mannikins (Lonchura castaneothorax) were hopping around in our driveway, picking up termite alates (winged termites), which had just swarmed from their mound, and even catching them in mid-air. 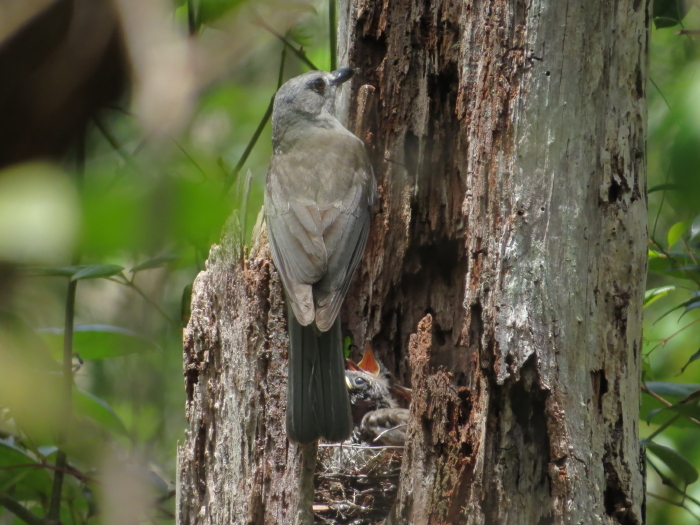 It was surprising to see such typical seed-eaters gorging themselves on insects – and performing some very acrobatic manoeuvres. Maybe the female finches are stocking up on protein for the production of eggs. 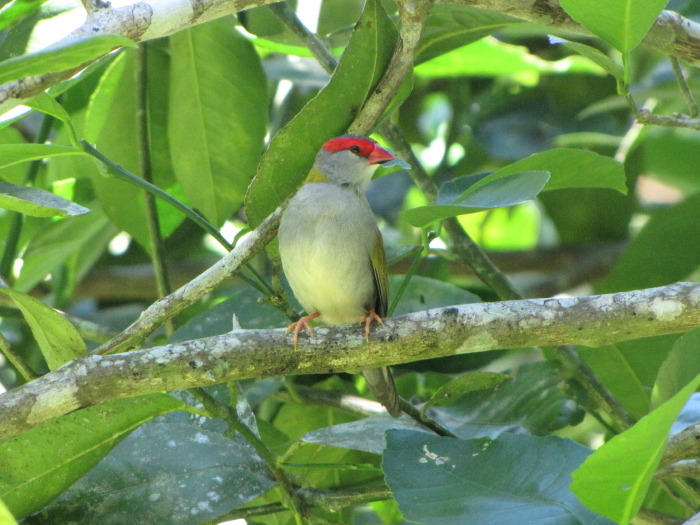 We normally do not have finches on our rainforest property- the grassy areas are rather small. 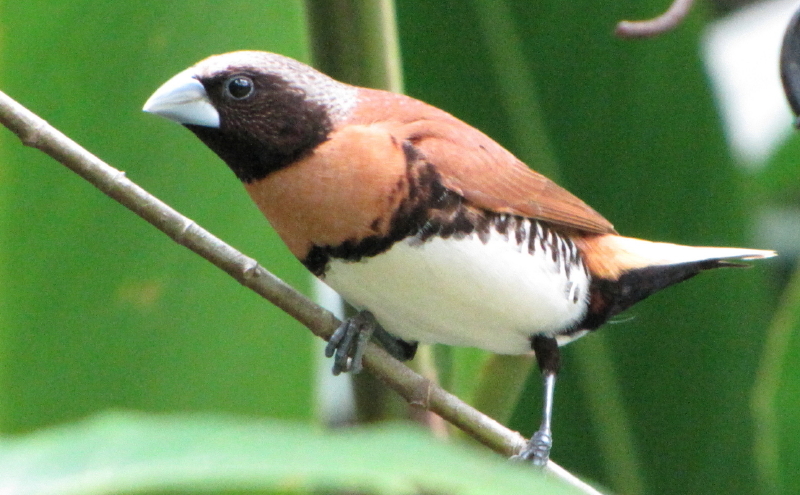 A few pairs of red-browed finches usually arrive in November to build nests, mainly in the palm trees, but then leave at the end of the wet season. This year, two pairs decided to stay (possibly because we left a few patches of lawn to go to seed), and we put out some bird seed for them. This must have stopped a small flock of chestnut-breasted mannikins in their tracks (we never had them here before) – and they told their friends! We now have a flock of over 100 (they are really difficult to count, being very flighty). We are eagerly awaiting dad’s return after he disappeared more than 2 months ago. He never brooded the clutch of 8 eggs he had in early July and abandoned that nest. Hopefully, the female produced another batch for him. She is still visiting every 5 to 15 days, looking a bit worse for wear, having lost the rich gloss of her plumage and rather threadbare thighs ( the male scratches her thighs with his claws, when she is sitting down, and he tries to get into mating position). So, presumably, she has been mating with another male. Fascinating; I like your blog and website.